and against that it is directed. There are many reasons for the tremendous resurgence of backgammon, but one aspect of the game in particular makes it unique. There is no other game involving skill in which the beginner after a short time reaches a level from which he has a definite chance to beat anyone else, no matter how good his opponent. This is a built-in hazard for the experienced player, a great boon for the newcomer and adds excitement for kibitzers and participants alike. The rules of the game are simple, their execution an art; this is backgammon’s pervasive principle. However, it is the game’s apparent simplicity that is its greatest attraction. Almost anyone can learn 60 percent of the moves in a week, and we know of no one who did not believe that he actually understood the game in a few days. But backgammon is so subtle that it may be impossible to learn all there is to know about it. One of the world’s leading players, who has played for thirty years, admits that he probably understands only 90 percent of the game. As you must know by now, backgammon is more complex than it first appears to be. Because of the subtle skills involved (most average players believe those who are better than themselves are lucky), and because most players tend to rationalize the dice, blaming their misfortunes on “bad luck,” it is difficult not only to recognize your mistakes, but to evaluate your abilities. The game is usually played for money, and self-deception can be expensive. Given the luck, the self-deception, and the fact that there is no other game in which a player can so often make the wrong move and win as a direct result of it, backgammon has become for many of its devotees an exquisite siren song, a honeyed land of hope and double 6’s. It is for these reasons that we have called backgammon the cruelest game. Like some concealed and irreplaceable mechanism, cruelty is built into the game. For example, it is replete with paradox. Once the dice have been thrown, a battle begins, and each succeeding roll will alter the position, the tactics and the strategies. Certain basic theories, all sound, may have to be violated at any time. It is this elusive principle that is probably the most difficult to comprehend — and the most destructive when it is not brought into play. The beginner will learn the fundamental rules — and will then be told that he must contradict them. Though many players acquire other more mechanical skills, they never completely grasp this. But it is this flair for improvisation which separates the average player from the expert. A good player is one who plays his bad rolls well. A chronic loser loses because he is unable to play his difficult rolls to his best advantage. Anyone knows how to bear off four men when he has rolled double 6’s. All too often the wrong computation, the wrong decision, and hence the incorrect move will win. This is the most unkindest cut of all. But it happens so often that players who have won as a direct result of it attribute their success to skill and believe the game requires no further study. Backgammon is glutted with such people. If one attempts to explain certain percentages to them, they are merely insulted. When they lose in money games or tournaments, they will later confide to intimates that their opponent was unbelievably lucky and their own dice unbelievably bad. In this aspect, no other game can be compared to backgammon. For example, if you challenged Bobby Fischer at chess, and for some reason he accepted, you would not win a single game. In bridge, an inferior player will seldom win a tournament, and in poker the best player will almost always win. Except for chess, there is an element of luck in the above games. In backgammon, however, the luck factor is dominant. Though many of the percentages in backgammon are calculable, the ratio between luck and skill remains obscure and has probably been discussed for as long as the game has existed. 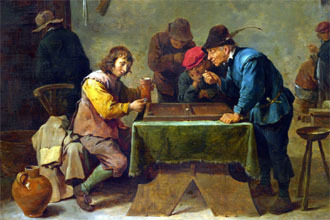 Because it is not as logical as chess or as scientifically exact as checkers (a game so restrictively formal that if two experts play, the one who moves first always wins), it is often dismissed by the unknowing as just one more game of chance performed by gamblers who might just as well be flipping coins. Although the ratio of skill to luck is impossible to compute exactly, it is generally agreed that when the adversaries are evenly matched (both technically and emotionally), the game is all dice. Over the short term, an average or good player can beat a superior player, but in the long run even the “unlucky” expert will win, for the law of averages is as infallible as the law of gravity. We believe that the proportion of luck to skill in backgammon is approximately 80 to 20, but a 20 percent edge is an insurmountable advantage. Take Las Vegas. If you play craps against the house and play correctly (that is, giving yourself the best chance), the percentage in favor of the house is actually less than 1 percent. But given that minuscule advantage, in the long run the house will win. In comparison, the 2Oipercent skill factor in backgammon is overwhelming. As another example, what possibilities exist for horse-players when the track takes 15 to 17 percent out of every dollar they bet? None. You can only win consistently at the track if you have somehow fixed the race or have managed to obtain inside information. In backgammon, an understanding of the correct percentage moves in specific situations qualifies as “inside information” and will enable you to win in the long run. But not every time, alas, and often not even in what you believe to be crucial games. This condition must be accepted philosophically, of course, and should not deter you from continuing a detailed study of the game. 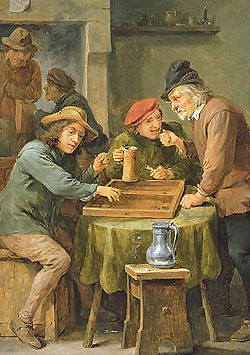 Backgammon is not a game in which luck should be taken seriously, though many players continue to gamble at it, apparently relying on the spurious advice of the Oriental sage who claimed that if you threw a lucky man into the sea, he would emerge with a fish in his mouth. Such players forget that though they are gambling, the experts are not. Gamesmen rather than gamblers, the experts always have an edge because they know infinitely more about the game. Like many other endeavors, backgammon is a game of levels; to play against the experts for money is nothing more than another version of Russian roulette. Backgammon might be compared to Alice in Wonderland. On one level, that book can be described as a droll fairy tale, but among the childish games, improbable characters and laughter there is a subtle allegory that tells an altogether separate tale. In much the same way, backgammon can be learned and played forever as a rather simple game of chance: once it is taken seriously, however, cunning labyrinths and curious paradoxes begin to appear. This book has attempted both to teach the beginner how to play and to enjoy the game, and to present at least a few of the game’s more intricate conundrums. A note about kibitzing: If you are not directly involved and are watching a match, no matter what happens at the table — repeat, no matter what — say nothing. Form any opinion you wish about the play or players, but remain silent. Should some flagrant error astonish you, steal quietly away. When the match is over, but not until then, you can approach either contestant and raise your questions or objections, but never during play. If an argument arises between the two players and you feel sure you know who is in the right and can show why, still say nothing — unless, and this is vital, you are appealed to by both opponents. Over the years, at tournaments and in money games, we have seen specific positions presented to experts who will then argue the relative merits of the “right” move. Rarely do they agree. At the end of these discussions, each man will go his separate way convinced, however secretly, that he was right and the rest of them were wrong. 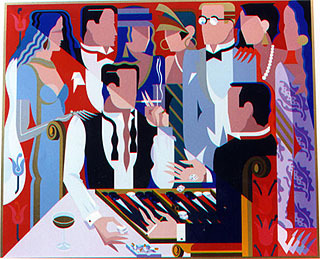 Backgammon seems not only to attract but to elicit the most outrageously egotistical behavior. If, for instance, a confidential questionnaire were sent to thirty acknowledged experts and each was asked to fill in his choice for the one best player in the world, you would get thirty different nominations, all autobiographical. More often than not, the expert was not sure that he was right, but being an “expert,” he was expected to take a stand, which he will uphold for illogical reasons. In bridge, for example, upon analysis the correct percentage play can almost always be determined, but though there are positions in backgammon where the proper move is self-evident, there are countless others where it is almost impossible to get a majority opinion. In Diagram 93, for example, black has rolled a 6-4. What is the correct move? There are at least three good options, but expert opinion is invariably divided. There is also a certain amount of gamesmanship to be employed in backgammon. As in any other competition, it is never advisable to appear nervous or uncomfortable when you sit down to play. This is particularly true when you are opposed by a well-known player. Never greet him by saying, “You’re too good for me. I’m only a beginner and don’t have a chance against someone like you.” There is only one instance when you can say this: when you don’t mean a word of it! Given the uncertainties of the game, you always have a chance, and with determination and the dice you can upset the most expert of players. If you tend to play slowly — and at first you probably will — don’t be intimidated by an opponent who rushes his moves. Take your time, no matter how much he hurries you. Attempt to play your routine moves with a certain steady rhythm and without hesitating needlessly — but only when you feel secure in doing so. As you improve, you will grasp the problem created by each specific move more quickly, and so make your plays with assurance and finality. Occasionally, of course, there will be a difficult decision with which you’ll have to take some time, and this is to be expected; in general, however, try to develop the habit of making your mind up fast and react accordingly. The board is comparatively small, and your position and your opponent’s are in front of you at all times, so try to avoid “balks.” When part of your roll is “forced” — that is, if you have a 5-4 to play and there is only one 5 — move this 5 immediately, and then concentrate on the best deployment of the 4. Many players will roll the dice and immediately play the number, but having done so, they will retract the move and make another play elsewhere, then vacillate again and make yet another move. Soon they are back to where they began and in a quandary. Sometimes it’s difficult to choose the best percentage move, but try to train yourself to avoid this kind of play by thinking the situation through before touching your men. What it boils down to is simply mental discipline, which is as valuable in life as it is in a game. This sort of intangible is a valuable asset every time you sit down to play. Size up your opponent immediately. Attempt to estimate his strengths and weaknesses. If he is more experienced than you, use every legal ploy you have to equalize his edge. For instance, you should attempt to make every game as simple as possible. Against better players, always seek simple positions. Block and run as best you can, and at all times avoid back games. Further, if your opponent attempts to needle you, remain impervious. If he stalls, allow him to do so without becoming irritated. If he talks, try not to listen, nor to fall into conversation. Concentrate on the game at hand and ignore anything that intervenes. Check all of your opponent’s moves and remember that it is not considered unethical to allow him to place his man in the wrong spot if it is to your advantage. In short, display as little emotion as possible, and try to disregard bad luck or the fortune which may seem to favor the enemy. The good player is one who does not compound his losses with personal feelings. “And yet,” as one expert has said, “99 percent of the people who play double up when they are losing and draw back when they are ahead. You must look at backgammon in the same way that you would look at a business reversal over which you had no control.” Of course this is a question of discipline — but discipline is a quality that can be learned. There is an interesting and complex psychological factor at work in the taking or dropping of a double. Assume that in a chouette over a period of a few months certain players dropped 1,000 games in which they were doubled, and were correct 700 times and wrong 300, none of which was a gammon. For many people the actual money gambled is not the primary incentive. They enjoy the challenge and want to win more for winning’s sake than for receiving financial rewards. Such people like to be proved correct; it is part of their pleasure and boosts their egos. 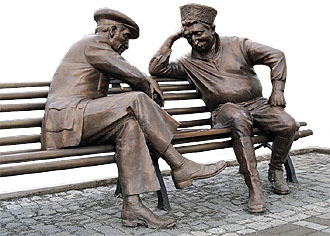 If you were able to look into these players’ minds and psyches, you might find that they actually preferred to be correct in their decisions 70 percent of the time, even though they are subconsciously aware that if they had been wrong 70 percent of the time (that is, if they had accepted all the doubles), they would be better off financially. The droppers of those thousand games are minus 1,000 units; if they had taken, they would be minus 1,400 + 600, for a net of minus 800. Many takable doubles are dropped because of such an outlook. Perhaps in these cases the individual is receiving emotional fulfillment amply compensating him for his lower financial rewards. We are not arguing for or against such eccentric behavior; we merely state that it exists and occurs in many more instances than is realized. As mentioned earlier, the ego is rampant throughout the backgammon world (probably more unjustifiably than in any other game, since the dice are the controlling factor), and the desire to be “right” is neither consciously recognized nor admitted by most players. It is a factor worth thinking about, though, and perhaps there is a latent streak of it in all those people who drop too soon. The point is, those players who drop takable doubles are paying out good money that they don’t have to lose. When you do lose — and you will — try hard not to say that your opponent out-lucked you. Nobody particularly cares that you missed two triple shots and that your opponent hit a 17–1 shot to win the whole match. But if the provocation is too much and you must moan a little, never tell your opponent that he played a move incorrectly. Even if it is true, what have you gained? Restrain yourself, congratulate him, and contrive to smile! This is important, because regardless of how good you are, you’re going to gain considerable experience in being a loser. Conversely, when you win, attempt to be gracious; if you have been lucky, admit it. No matter how badly your opponent behaves, neither argue nor disagree; after all, you can afford to be generous. The discipline that pervades the game should also control the amount of money for which you play. This may seem too obvious to dwell on, but more than a few players involve themselves in high-stake games which invariably meet with the predictable conclusion. If the amount of money you are playing for makes you uncomfortable, you should not be playing for that stake. That is the key to what you should play for. What you can “afford” is not necessarily the stake at which you feel comfortable, whether it is high or low. The two can be quite different. Assume that you are a millionaire many times over. You can “afford” to play for almost any stake, but the chances are that you would be uncomfortable long before you reached the sum you could not afford. The amount to play for is that which does not divert your attention from your main concern — the game. This is not a lecture on how to conduct a life style or an attempt to dictate the stakes you should play for. Our sole purpose is to help you play in the most comfortable frame of mind. Whether or not you have a fortune, if the stake distresses you, simply decline to play in that particular game. If you allow your ego to get the upper hand and are seduced into a bigger game, you are at a distinct disadvantage. You may out-luck it and win, but in the long run you are a favorite to lose because you will inevitably drop doubles that you should take, or not double when you should, for fear of increasing the stakes. Why expose yourself through false pride to such a situation? To sum up: the stake that permits you to play at your best is the stake that permits you to relax — regardless of what you can afford. What we have been primarily concerned with in this chapter are the psychological traps into which every player has periodically fallen. It is to these specific traps that we wish to direct your attention, since if they are not recognized and remedied, your backgammon talents will not progress beyond mere technical expertise. An eminent neuropsychiatrist and analyst believes that to win at any game, you must first understand the specific skills involved, and secondly the specific traps — that is, the psychology of the snares laid by your adversary. If you have mastered neither the skills nor the trap’s alternatives and still insist on entering the game, you are throwing a razor-sharp boomerang which will ultimately cut off your own head. The psychiatrist goes on to say that the professionals of any game are those who place their opponents in various categories, and then apply the trap most likely to seduce them. It is the failure to recognize these traps and the subsequent inability to exert some rational control over the course of events that not only indicate but instigate disaster. This is yet another of the game’s paradoxes, and perhaps its most important one. It is a game of war, a series of all-or-nothing skirmishes conducted for the most part in civilized company toward civilized ends. It is what Nick the Greek, that most infamous of American gamblers, had in mind when, in discussing expert game-playing, he said, “It is the art of polite bushwhacking.” Given the scope of backgammon and its infinite possibilities, it is the consummate encounter.